There are times in your life when someone crosses your path and leaves a marked impact on your life. A person who touches you so profoundly that immediate despair sets in when you are told they have passed. This was my friend, Lise I just learned that she lost her battle with stage 4 breast cancer. She was a modest and unassuming soul who always brought a smile and laughter to those around her. She was always the fiercest of supporters whenever her friends were in need, and her generous spirit had her giving away her master talents as an artist to many nonprofits like the Englewood Community Redevelopment Area Advisory Committee, Olde Englewood Village Association, Lemon Bay Myakka Trail Scenic Highway Committee, Florida Lighthouse Association and Barrier Island Parks Society (BIPS). 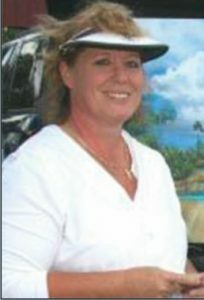 I first met Lise about 10 years ago when I first became involved in the Lemon Bay Myakka Trail committee. She had been on the committee from its inception wanting to beautify Englewood, her home of many years. We instantly bonded becoming fast friends. She was a gutsy lady, not afraid to speak her mind and defend what she believed to be right. She had the greatest sense of humor with a contagious laugh and million dollar smile that could warm anyone’s heart. She did not require a lot of sleep and used that time to create…she was a hard worker. She was always busy helping others as well as running her own art and embroidery business with her sister, April, and spending time with her kids, grandchildren and many friends. She was an avid golfer and bowler, playing with the same “Calendar Girls” golf team and the bowling league down at Spanky’s for years. When I asked her help to complete sketches of sea creatures for our new Wading Adventures program she jumped in wholeheartedly. She had never painted these types of creatures before, but thought it would be fun. Years later, I asked if she would create artwork for the Gasparilla Island Lighthouse campaign, she instantly said yes, asked a lot of questions and then set about working on it. She would constantly ask for input until it became what you were looking for. She always wanted to please, even if it caused her additional hours of work, in this case, all of it donated. Her devotion to our cause to restore the Lighthouse and considerable talent shown through in the sketch that we used in the campaign that became beloved by so many. The sketch later became a painting, now one of our organization’s most proud possessions. When I began working on the redesign for the Florida Lighthouse Association license plate, I knew she was the perfect person for the job. She, of course said, yes again. She actually told me, “I have never designed a license plate before I think it will be great fun!” Sadly, her painting was never complete, but I am hoping we can still use her sketch to create a license plate in memory of her. It would be a well-deserved legacy for someone who always gave so much. Lise was a master artist and considered her amazing artistic talent a gift. She once said, “I don’t know why God gave me this ability, but I never take it for granted….I embrace it…I enjoy it….I live for it.” Her artwork was hung at Hughes Gallery and many of you probably saw many of her beautiful seascapes. Barbara Hughes said, “I’ve never known any painter who rendered the beauty of Boca Grande skies and water, like she did.” Unlike most artists, Lise did not stick to one genre. She would be moved by something and just paint it. One of her last passions was painting and supporting primates. She was relentless in her pursuit of what was right and just in the world, especially when it came to animals. She was really touched by the widely reported story of Harambe, the ape who was shot because a young boy fell into his cage. She felt it was so unjust that the ape was killed and painted this full-scale, beautiful and realistic painting of him. When you looked at his eyes, you could see what she was trying to show, his intelligence. There are photos on her a Facebook page showing her working on the full scale painting. It was a moving and beautifully executed piece of art. The painting actually connected her to the Center of Great Apes which inspired her to paint another primate, Harry, an orangutan. It was her desire to help this nonprofit group raise awareness and their need for a new sanctuary building. They take care of primates from all over the world and are located in Wauchula, Florida. Lise is survived by her husband Frank; her sons Jordan and Colby; grandchildren, McKinley and Elijah; nephews and nieces; her two sisters, April and Paulette and her brother, Patrick. Her celebration of life will be held on Saturday, March 10 from 4:00 pm to 6:00 pm at Gulf Pines Memorial Park, 2401 Englewood Road. In lieu of flowers, the family asked that contributions be made to: Center for Great Apes, P.O. Box 488, Wauchula, FL 33873. Lise, you will be dearly missed and never forgotten.